CECL is not only about compliance. It’s about maximizing shareholder value, strategic planning, capital planning and M&A. We can estimate a bank’s CECL reserve today. We turn the stress off in our stress testing system and adjust the time horizon to reflect the remaining life of the loan, using both loan-level and public data. The solution is immediate and turn-key. It works because our system was proven effective even as FASB members were still debating the CECL standard. CECL will change how investors view a bank’s balance sheet. Invictus can show CEOs what that picture could look like, so they can optimize their bank for implementation. Expected loss modeling (PD and LGD). You can tailor the system to your needs. Outsource it all to Invictus, or do parts of it yourself. We provide the data and analytics to support and defend your reserve levels with regulators. Your bank won’t lose earnings by having to set aside too much in ALLL. The Current Expected Credit Loss model, a new accounting standard, may increase provision amounts for banks and cost them money. Our analysis shows CECL may benefit community banks if executed properly. Proper execution of CECL involves leveraging loan level detail and focusing on optimization rather than compliance. This helps you understand the real cost of originating future loans so you can outsmart your peers and maximize profitability. Loans may require higher reserves depending on existing economic conditions. Invictus is the only company that can provide a dual CECL and stress testing solution. CECL and loan portfolio stress testing depend on the same raw data. They should utilize the same analytical techniques but different economic scenarios. This will save you time and money, while also ensuring the highest standard of analytical integrity. 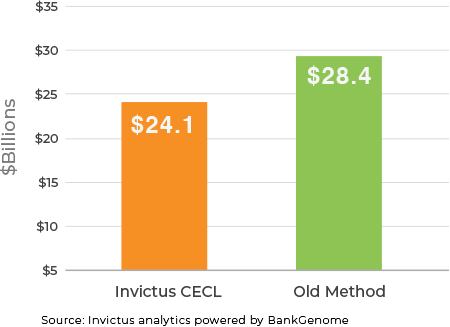 Invictus is the only provider that can assess the impact of CECL on an M&A target from publicly available information. We use proprietary algorithms such as LoanLayering®, which estimates the vintage profile of each loan portfolio. This allows us to quantify additional hidden value or risk that will affect the valuation and negotiation strategy. Invictus fine-tunes the CECL estimate once loan-level data becomes available in a data room.